Week two in Freiburg provided me with the opportunity to finally immerse myself in the daily life of this city. Though we did have two hours of German per day, our only other class was an “Integrative Seminar” course, which has mainly been giving us informative background on the EU and its current state. This has given us plenty of time to get lost exploring the city and helped us to get a sense of what the rest of our semester will be like while we are in Freiburg. 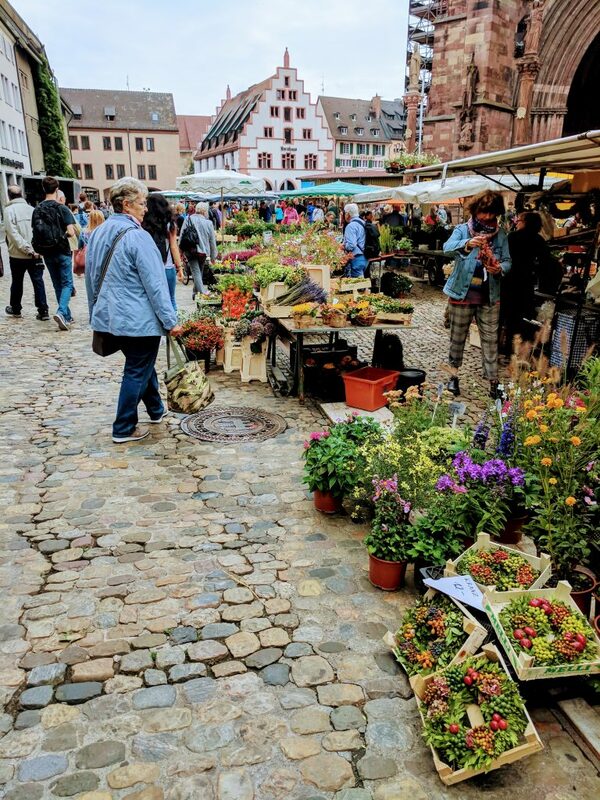 Franziska, my German teacher, gave our class an assignment to walk around and ask questions about the Münstermarkt, which is essentially a large open-air market held in the main town square of Freiburg. And these shop owners are dedicated. Münstermarkt runs every day of the year except for Sundays, including throughout the winter months. It also isn’t your typical farmer’s market – Münstermarkt has souvenirs, flowers, ‘Holzkunst’ (or wood art), wine, and various other items. The market surrounds the church in the town center, pictured on the right. Here is one of the many stands selling various flowers and plants. Both locals and tourists frequent the market, and many of the stands are quite well-known. From the cheesecake stand ‘Stephans Käsekuchen’ who are famous for their secret recipe to the hot dogs on steroids called ‘Lange Rote,’ the options provided at Münstermarkt are delicious and relatively affordable for a college student like myself. 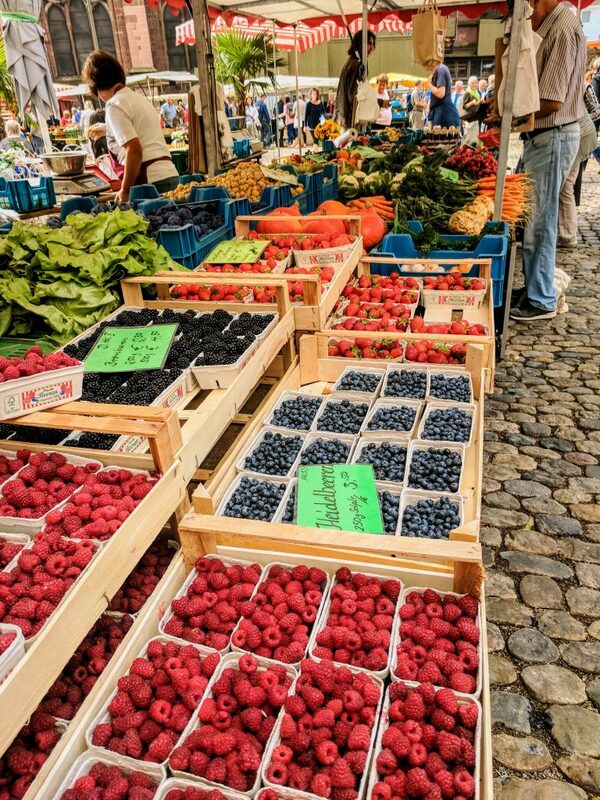 Only locally produced fruits can be found here, so you won’t see any bananas or pineapples, but the quality and relatively cheap prices of what they do have certainly makes up for it. After completing our assignment, my classmate Medina and I managed to make it all the way through the market with only four purchases. 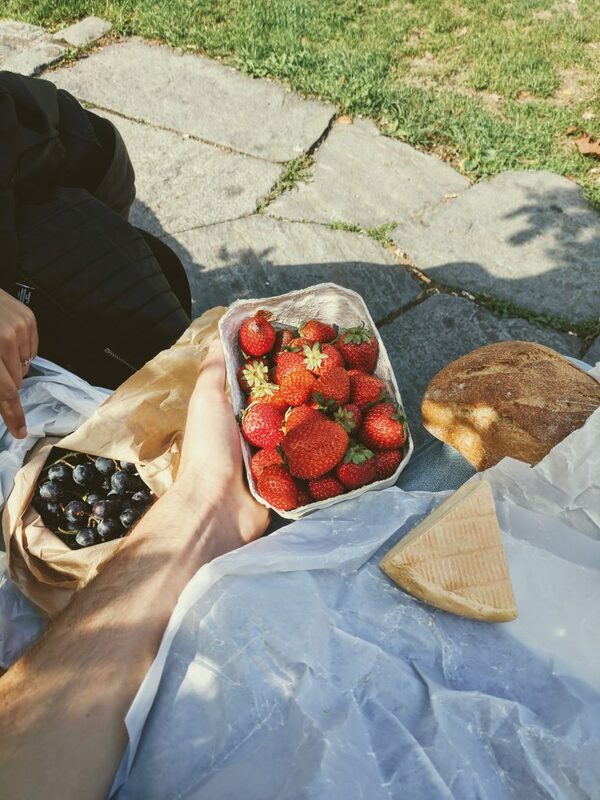 We then walked through the city center and sat down at a little park to eat away at our delicious lunch pictured above. 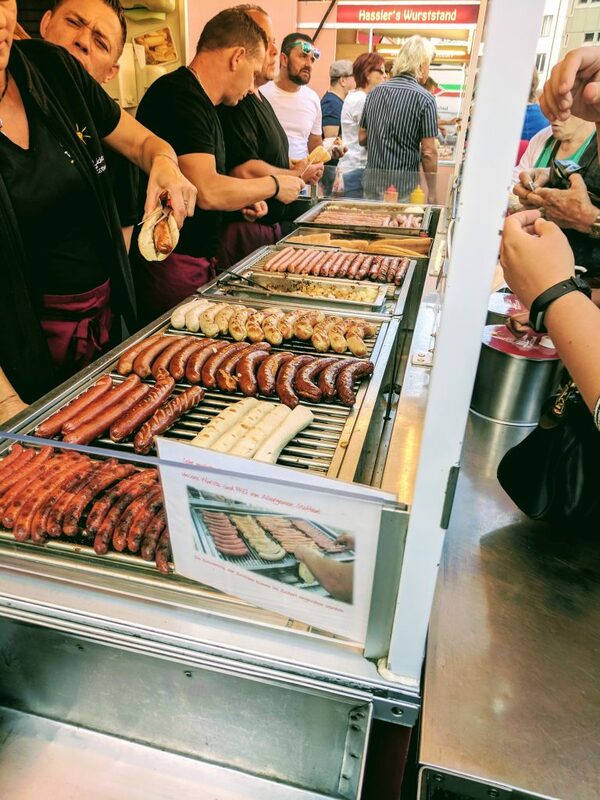 All of the food sold at Münstermarkt is produced locally, and the produce we bought there was some of the best I’ve had. 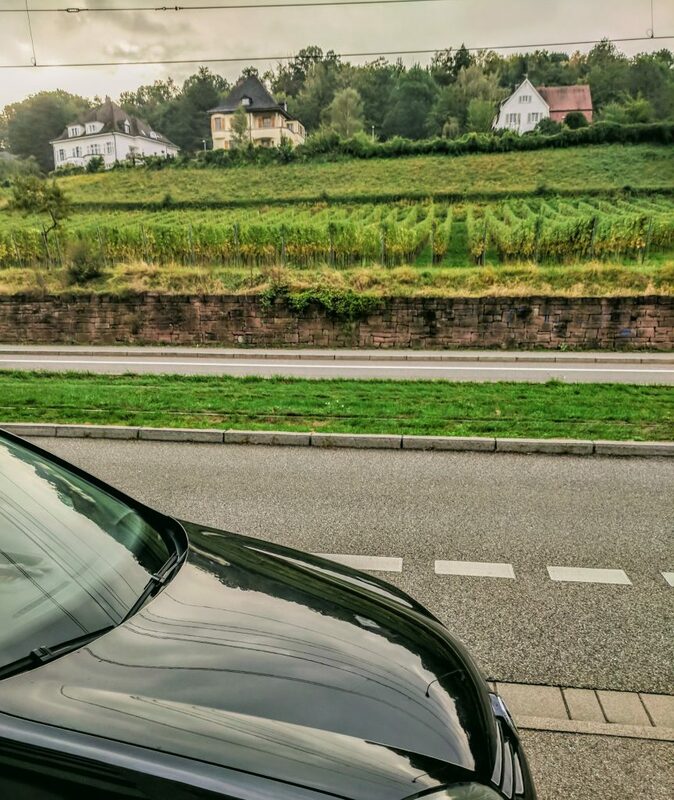 When in Europe, one finds it incredibly easy to get past minor speed bumps like seeds in your grapes. 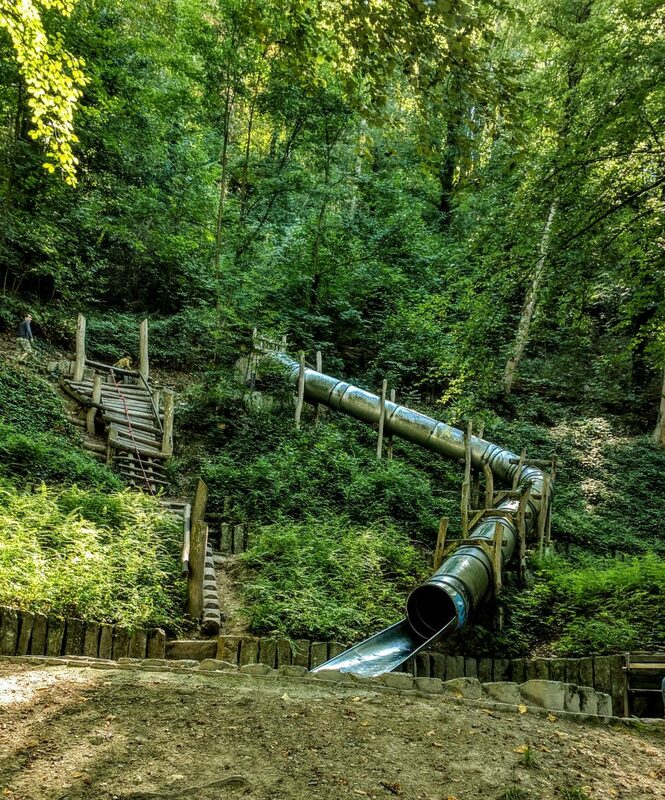 A slide some of us stumbled upon about 10 minutes from the city center. I’m not ashamed to say I went down it 3 times. 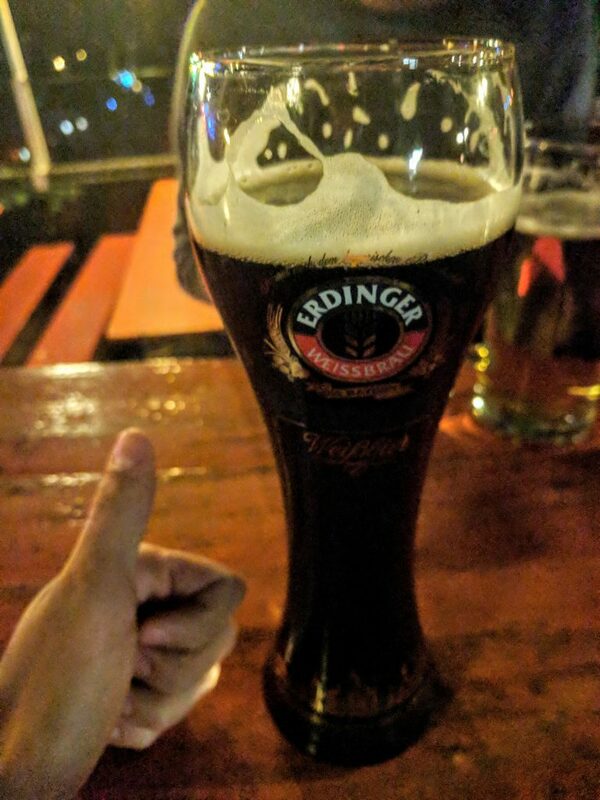 Need a place to socialize and get a good German beer? The Biergartens are the place for you. Another great thing about Freiburg are the Biergartens, the best of which is located at the top of a hill right next to the city center. Though we got there slightly too late for it a couple of nights ago, you can catch an incredible view of the sun setting behind the city. Combine that with the delicious local beer and you’re in for a treat. Next Next post: Fiestas Patrias in Chile!